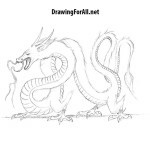 We created a lot of drawing lessons about dragons, such as lessons about a dragon for beginners and a Chinese dragon. 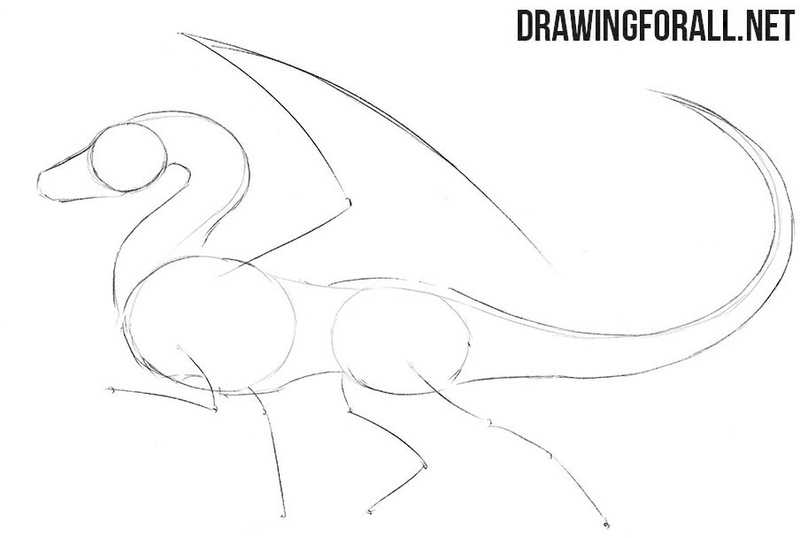 Today we want to make a fairly simple lesson, in which we will tech you how to draw a standing dragon. The very base of any drawing is of course the skeleton, and the lesson about the dragon is no exception. 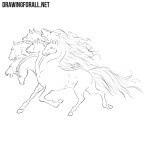 First of all, we sketch out the head and the long line of the neck, spine and tail. With the help of simple ovals sketch out the chest and pelvis. With very simple lines, we outline the limbs and wings. 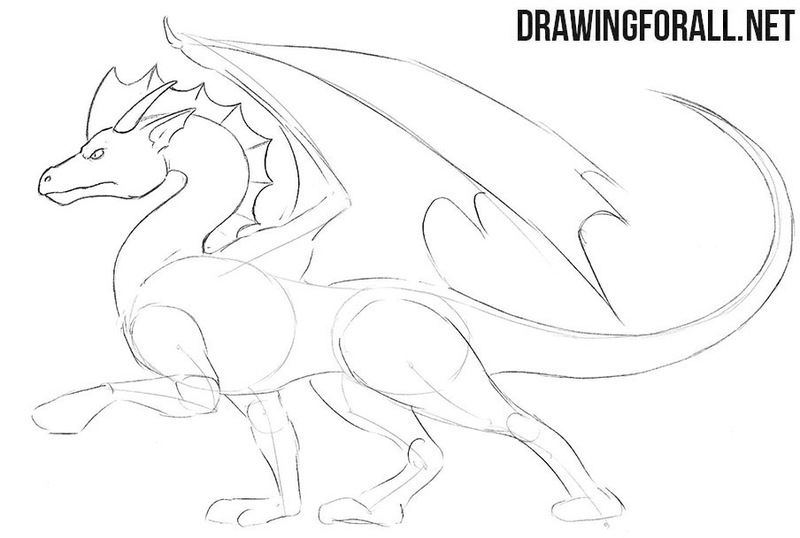 This step will be extremely simple as we add some volume to the dragon’s body. 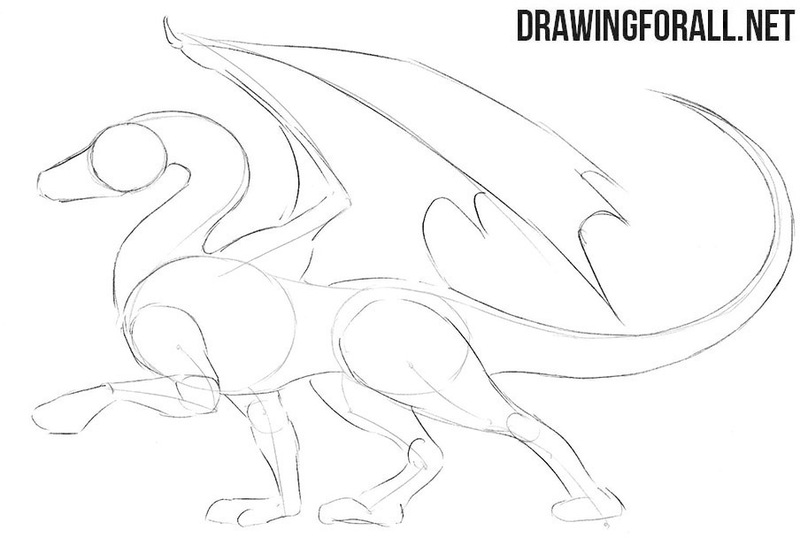 At first we will sketch out the dragon’s muzzle. Next we sketch out the outlines of the neck, which moves into the torso and then into the long tail. Let’s continue to add volume to the figure of our threatening dragon. Here we outline the huge wings, arms and legs of a monster. Note that the limbs should be muscular enough and look like a human’s limbs. So, the main outlines of the drawing are done, and starting from this step we will draw the dragon in details. We draw the outlines of the muzzle with a large mouth and frowning eyes. Remove unnecessary guidelines and proceed to the next step. We continue to draw the head of the dragon. Here we will need to draw long and sharp horns and ears. Next, draw the comb on the head and neck of our monster. Remove unnecessary guidelines and go to the torso. Continuing the neck lines in this step, we will carefully draw out the arms of the dragon, taking into account all the muscles and folds on the arms. Draw all the lines of the muscles and long fingers with sharp claws. In this step we draw the legs and long tail. On the legs we draw fingers with sharp claws, and on the tail we draw thorns. We complete the step by erasing all unnecessary lines. Now let’s circle the huge wings that look like bat wings. 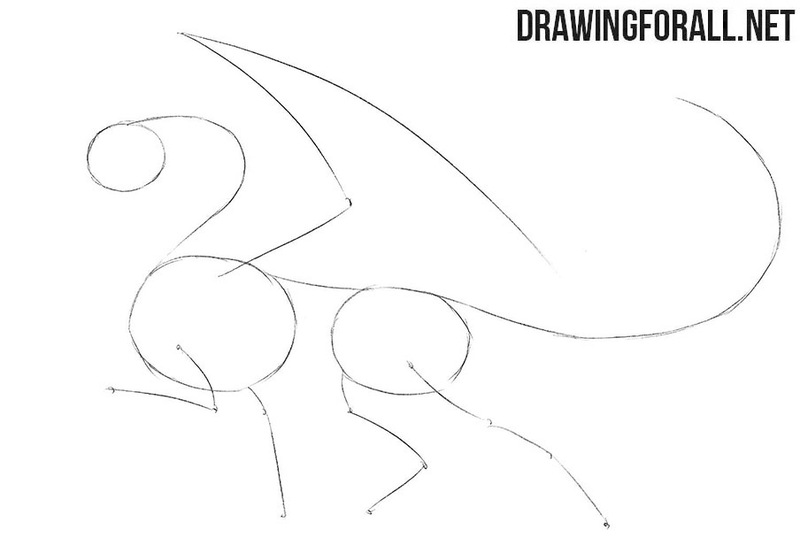 When drawing the wings of the dragon, consider all joints and folds, as our artists did. 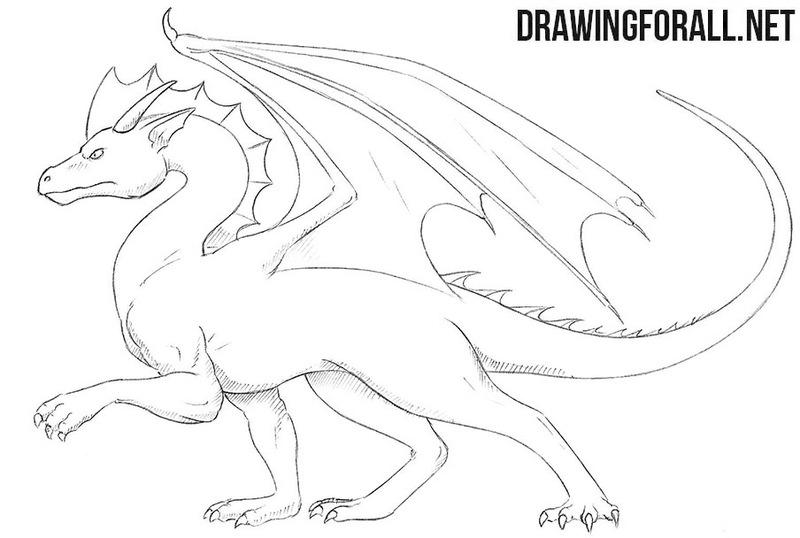 Erase all unnecessary lines from the dragon to make the drawing look clean and neat. To finalize the drawing lesson on how to draw a standing dragon, we need to draw all the necessary shadows. 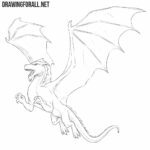 In order to do this correctly, we first define the light source, and then add hatching to the least lit portions of the dragon drawing. 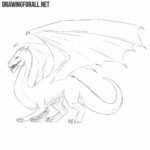 The lesson on how to draw a dragon is complete, but if you want even more similar lessons, then visit the Myths and Legends category on drawingforall.net, where you will find so many cool and interesting drawing lessons.